Many years ago, a young colleague of mine died suddenly from an aneurism. Everybody was shocked. I went to a friend’s office to tell him. “Did you hear about S.?” I asked. He hadn’t. When I told him about her untimely death, he looked at his watch and said, “Well that lunch date is off.” I was taken aback by such a cold reaction, and for a few years I had vaguely negative feelings toward him because of it. Over time the negative feelings dissipated. Looking back, I suspect his reaction was in fact a gesture of self-protection. In the 1970s I was in Warsaw for a course at the National Library of Poland. My family was with me, and one of my sisters took the opportunity to join us for a couple of weeks. In the 1970s World War II was still very much alive in the memories of the Poles, and one of the tourist attractions Warsaw offered was a documentary film on the systematic destruction of Warsaw by the Nazis. When we emerged from the theater into the sunlight, someone said, “Such wanton destruction. I can’t believe it.” My sister looked at her watch and said, “Well, I can’t believe I haven’t had lunch.” It seemed like a flippant reaction to the disturbing images we had just seen. In my sister’s case, this display of self-centeredness was dismayingly typical, but, in fact, she may have been simply protecting herself from the feelings of horror that the film provoked. Rational Emotive Behavioral Therapy (REBT), a psychotherapy founded by the American psychologist Albert Ellis, clearly draws on Stoicism. REBT’s basic premise is that we are not upset, or at least only partly upset, by what happens, but mostly by what we tell ourselves about what happens. 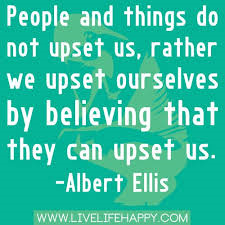 Ellis believed that we are strongly predisposed to upset ourselves with irrational beliefs. Let’s take my friend who reacted to our young colleague’s death by glancing at his watch and realizing he didn’t have to keep a lunch date. He might have reacted by telling himself that the death of such a young person was unbearable, that nobody should ever have to die at such an early age, that her parents would be devastated and parents should never have to bury a child, and so on. Such a line of thinking might lead him well beyond a reasonable sadness at the death of a colleague and into a state of depression. REBT uses a method that challenges such irrational beliefs: This death is sad, but hardly unbearable. It doesn’t make any sense to say that nobody should ever have to die at such an early age; in fact, young people die all the time. I came across REBT at a time in my life when I was subject to a lot of emotional stress, and I found it very powerful. By focusing on the ways we upset ourselves, REBT empowers us to take responsibility for our own emotional states and overcome feelings of helplessness. Once we accept that the world is not constructed to satisfy our wishes, we can be calm in the face of having our wishes thwarted. Sustaining such an acceptance, of course, is another matter. Depending on the outcome of the American elections, REBT therapists may have their work cut out for them. RET involves a rational process of analyzing disturbing thoughts or events, objective examination of our reactions and a structured process of creating a narrative around both the event and the feelings evoked. At the risk of offering an uninformed layperson’s point of view, It sounds like your friend was just plain thick. Well, he wasn’t applying the principles of REBT, that’s for sure. Sometimes reaction to bad news can be awkward and seem inappropriate. In retrospect, I’ve decided to give him the benefit of the doubt. I’ve had the opposite experience, with people expressing great concern about an upsetting event and a short time later showing no interest at all. I just find people hard to fathom. Indeed. We are a strange species.